Ok...is it in poor taste to be in love with a toilet? 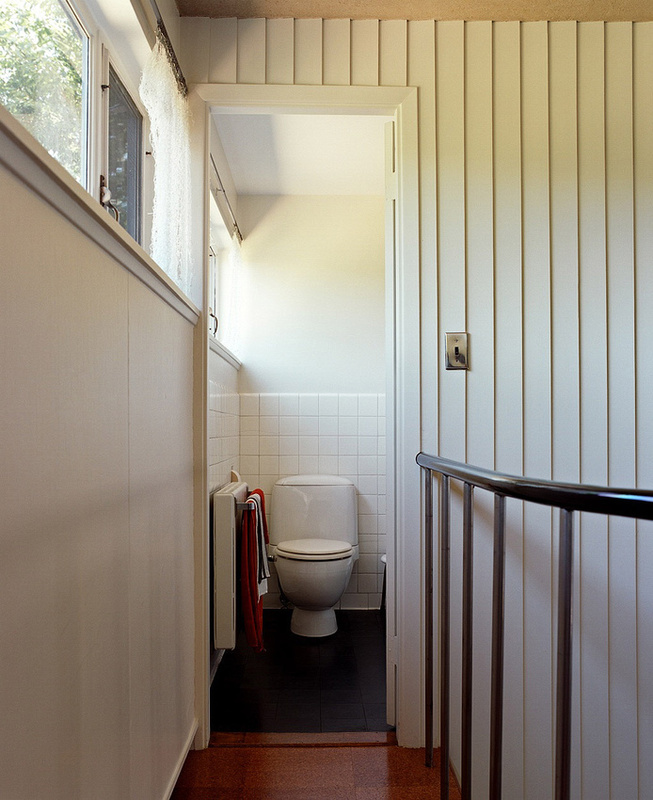 I truly think that Walter Gropius' is the perfectly designed toilet (if there is such a thing). I love the shape and how the top is slightly smaller and then curves down. When I toured the house - long before Handcrafted Modern was even an idea in my head - I was the crazy woman on the tour who would not stop talking about how perfect this toilet was. Such is life. I stand firm in my assessment. Back to some outtakes from Handcrafted Modern today. 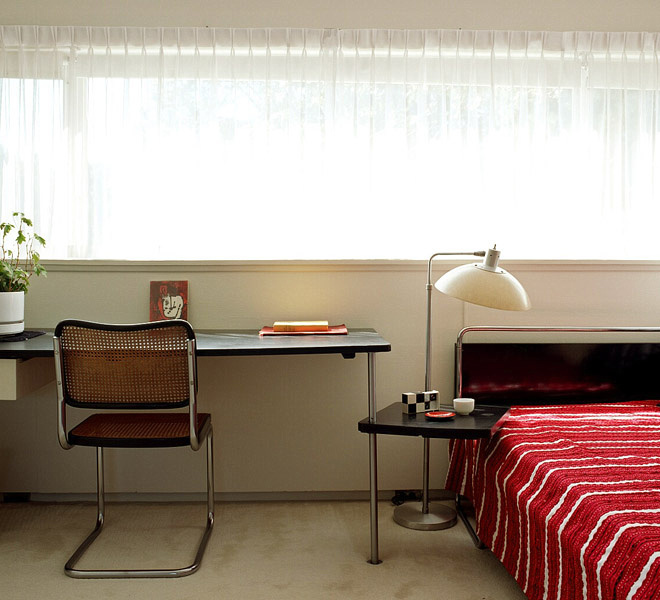 This is one of my favorite images from the Gropius house, but we went with a wider view of his daughter, Ati's, bedroom. Still, I like the quietness of this shot. 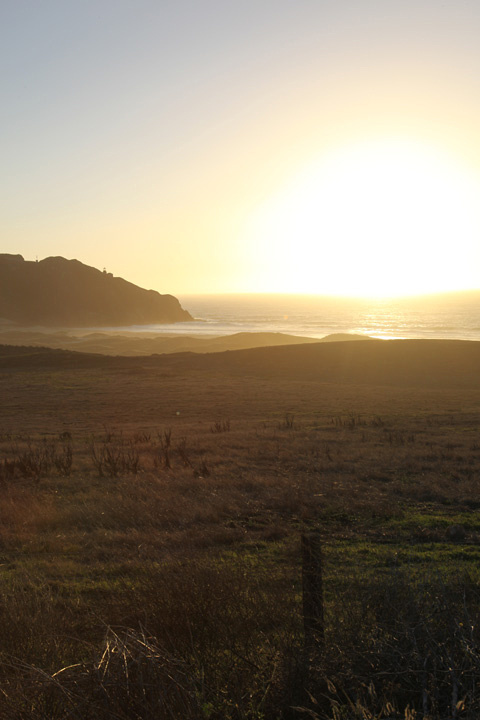 california book events...a big thank you! Just wanted to extend my sincerest thank you to everyone at William Stout Architectural Books in San Francisco and Heath Ceramics in LA for two wonderful book signings and slideshows last week. I get a bit nervous giving these talks sometimes, but I had such a great time! And thanks to everyone who came out and bought Handcrafted Modern. It was a joy to talk to so many of you and know that my enthusiasm and love for these people and homes are shared by so many. 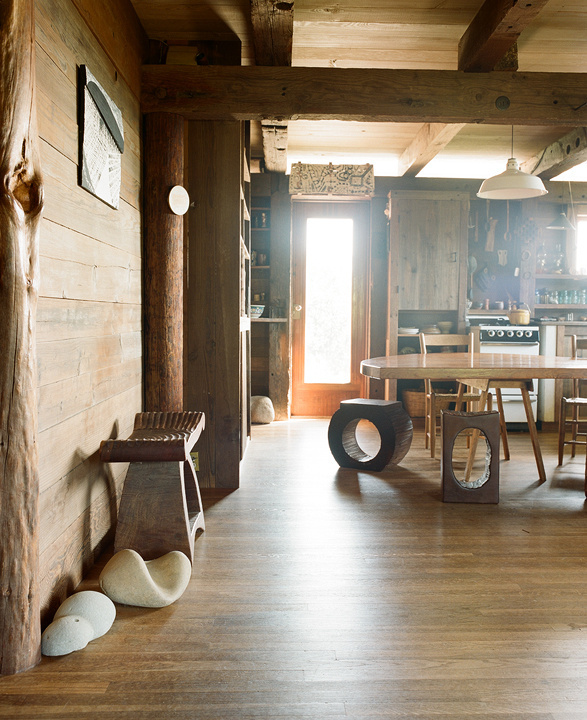 Another view of the lowest floor of Wharton Esherick's home. 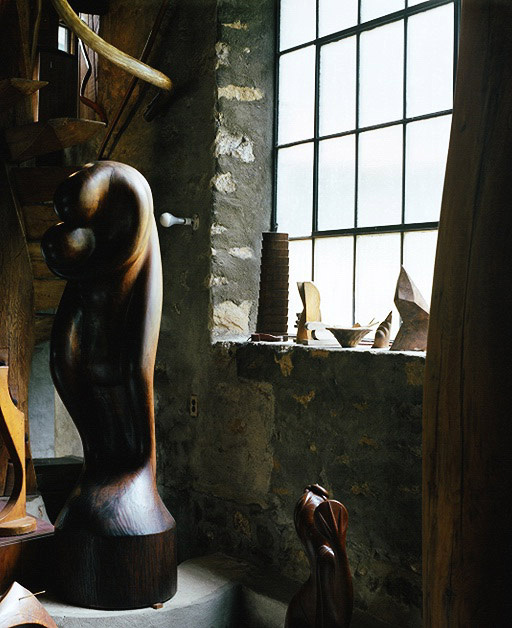 To the left is the sculpture "Mother and Child". On another note, thanks to everyone who came out to Williams Stout Annex in San Francisco last night. It was great to see so many friends - old and new. Heading to LA today with 8 beautiful prints in tow for my show at Heath Ceramics on Saturday. Should be fun! 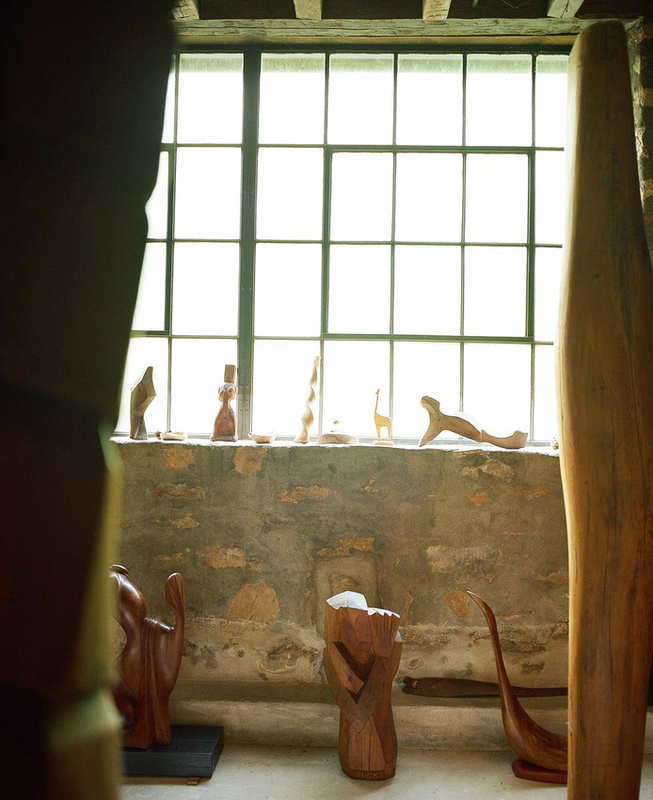 This view of the main floor of Wharton Esherick's home was another that did not make the final cut for Handcrafted Modern, but look at the amazing layers of his work in the background! And yes, that is a self portrait of him hanging on the wall. I especially love that burgundy color floor. Not sure if that is a stain or the type of wood...does anyone know? 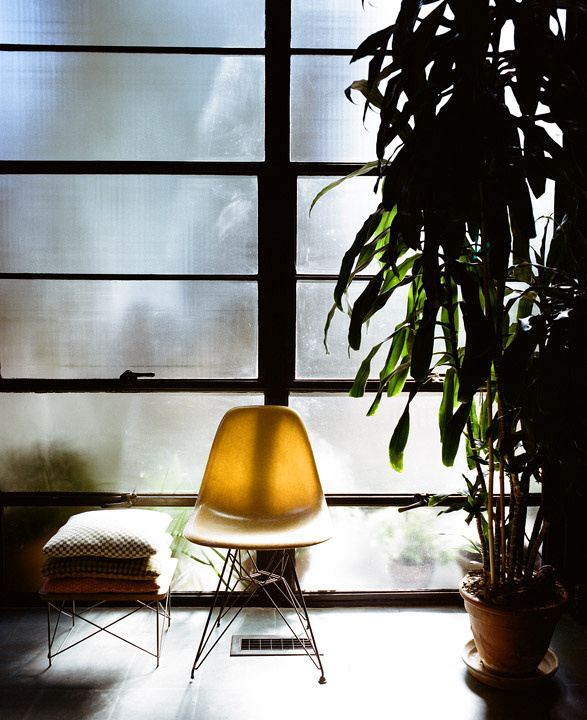 Another outtake from Wharton Esherick's home. 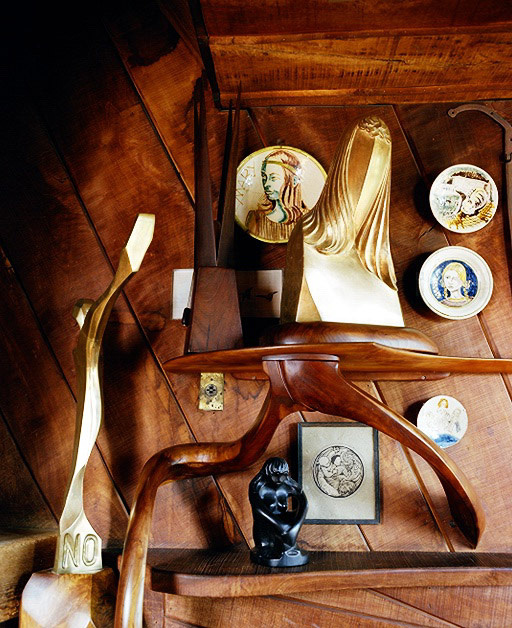 Most everything you see was made by Esherick wth the exception of the "portrait"ceramic plates made by his friend, Henry Varnum Poor. 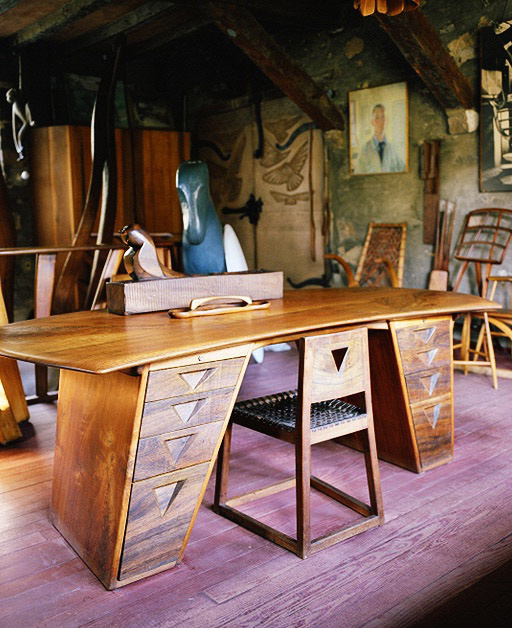 This week is Wharton Esherick week on my blog, friends. So today I am starting with one of the images that I tried (and tried) to have in the Esherick chapter of Handcrafted Modern. Most (if not all...?) 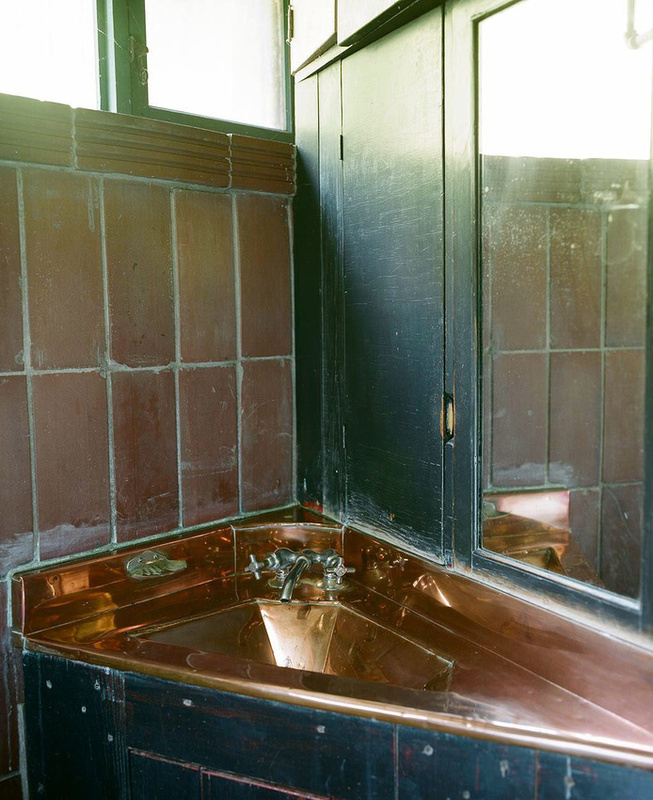 of the sinks in his home are copper like this and do not obey the usual laws of how sinks should look. Not rounded, not a traditional bowl per se, but an almost cubist version of a sink. 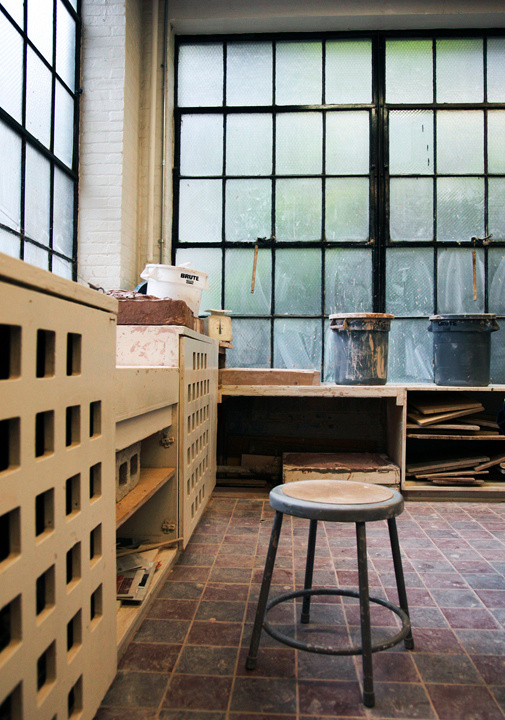 Of course, Esherick wrote his own rules so why should his sink be any different? Another outtake from Handcrafted Modern. This one of the upper living room at Russel Wright's home. Thrilled to say my NYC book launch at USM and co-hosted by Sight Unseen was a big success last night. So much to do and so many amazing people I am meeting...it is truly fantastic! Just landed in NYC and I can't wait for my book launch tomorrow night. USM (they of the highly covetable classic modern office systems) has been so kind to host my book launch with Sight Unseen. I am really looking forward to talking with Jill Singer of Sight Unseen and go through a little slideshow of some of the houses. At the USM showroom on Greene at 7pm. Know it is short notice, but I'd love to meet you and books will be available! So click on the link below. 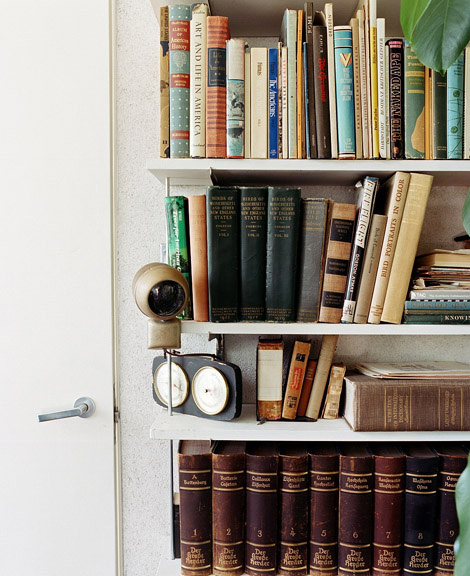 Just when I said I would post everyones bookshelves this week I changed my mind. I am heading back to NY today for my big book launch at USM on Wednesday night. When I am in NY, I am going to be delivering books to a few of the home owners - namely Irving Harper, Jens Risom and Vladimir Kagan. 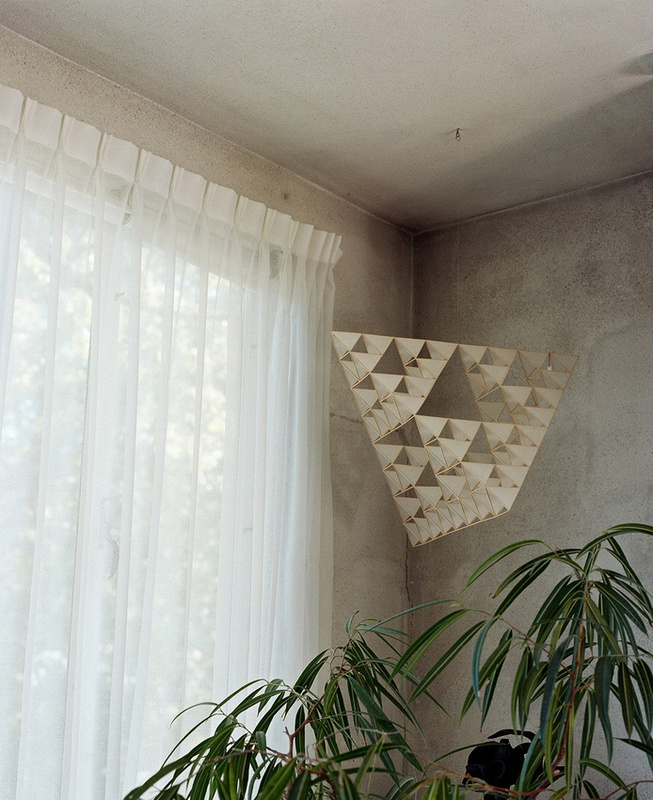 I had a chat with Vlady today and it made me want to post this image from his study. 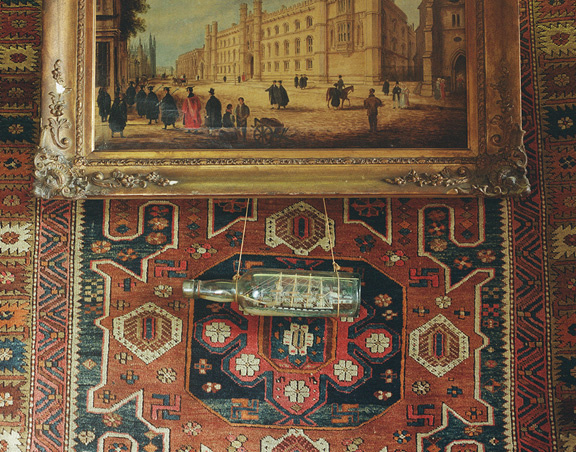 I absolutely love how he suspended the bottle so it seemingly dangled from the bottom of this painting. Not to mention the rug on the wall. I have been trying to decide on which outtakes to show you all this week and I finally came to the decision to show you everyones bookshelves. I got really interested in what everyone had on their bookshelves. Walter Gropius' was one of my favorites because he had a bunch of books on birds of New England (seen here). Then I noticed he had two sets of binoculars on his desk. I imagined him and his wife both watching birds out their office window. Continuing on with the outtakes from Handcrafted Modern. 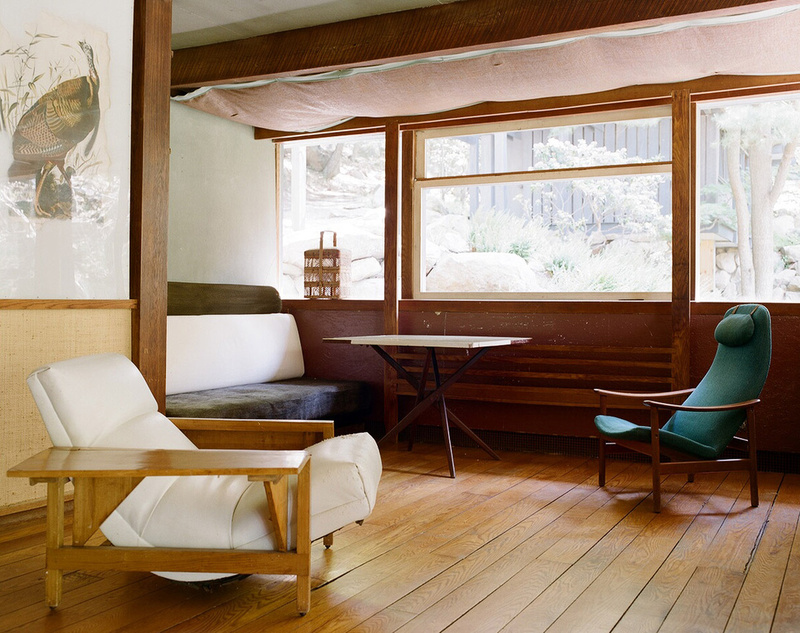 This entire room at Walter Gropius' house did not make it in to the book. Just so much good stuff and not enough pages! This is the guestroom. He continues his restrained color theme - black, white, grey with red accents. On another note, I have had a lot of firsts on these four days since the book was released. Yesterday I was interviewed in person for the first time, asked to sign my first book (and I blushed...I could feel it happen...) and Handcrafted Modern was in the NYTimes! Wow! (I hear myself saying "wow" a lot lately.) It is pretty awesome that Pilar Viladas likes my book. 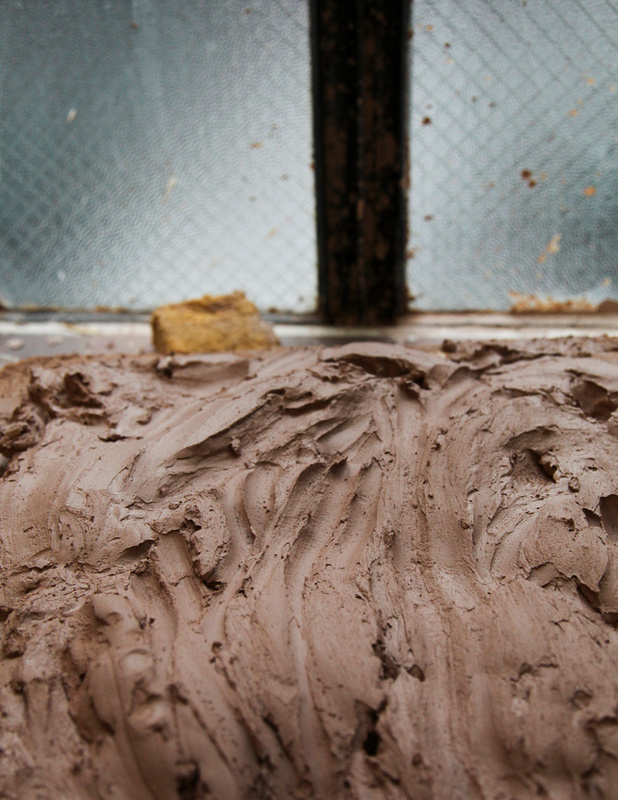 Another outtake from Handcrafted Modern. This one of JB Blunk's kitchen. I am in love with all the stools. Especially that round one...and look at the rocks! Can you imagine just finding those rocks?! Hands down my favorite image that did not make it in the book. I tried to get it in everywhere, but alas, it was not meant to be. 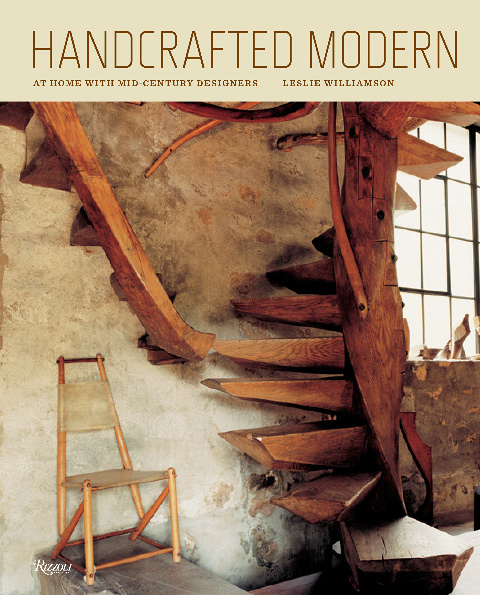 Well folks, my first book, Handcrafted Modern, is officially on the shelves today. When you get a copy, let me know what you think! For the rest of the week, I'll be posting outtakes. there is SO MUCH that didn't get in the book! 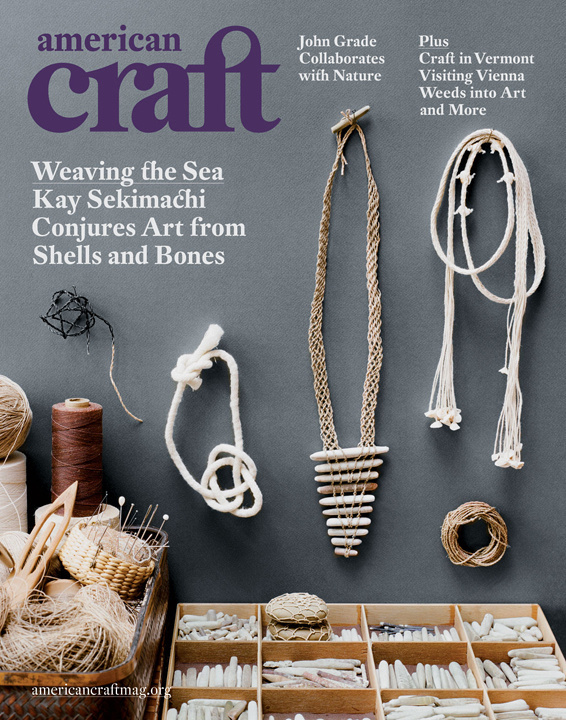 Just back from new york and I FINALLY got my hands on the new issue of American Craft magazine with my images of Kay Sekimachi's home, studio and beautiful work. And I got the cover! I have never been so happy with how my images were used and layed out in all my career. Creative Director, Jeanette Abbink, did such an amazing job...I really have no words. Isn't the cover lovely? It is hard to take a bad picture of Kay's beautiful work, though. Anyhow...I am really proud of this.